How about another note from Yesteryear! I’m pictured here on the “TCT Alive” set with host Crystal Thornton, where I was blessed to make my international television debut on the Total Christian Television” network. 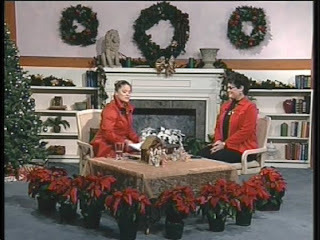 This episode of “TCT Alive” was recorded December 17, 2009 in the studio of TCT Affiliate WLXI, Greensboro, NC. The episode also first aired on this affiliate station, December 25. A big thanks again, to Rev. and Mrs. Larry Patton and the rest of the WLXI staff and volunteers, who made me feel so welcome while I was in Greensboro, and to my good friend, Susan, who assisted me with makeup choices that were very easy for me to apply independently. It is always a joy for me to meet more of my family in Christ! Stay tuned for more posts like this! Until next time, God bless you, and keep His Song in your heart!